In early 2009, five farmers in Southeast Georgia gathered with the dream of resurrecting olive oil production in Georgia and the Southeast US. 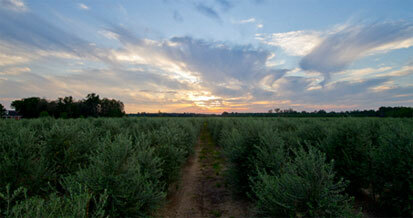 In 2011, Georgia Olive Farms harvested the first commercial crop of olives grown east of the Mississippi from their orchards near Lakeland, Georgia. 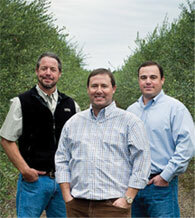 Georgia Olive Farms continues to encourage and support the development of the olive oil industry in the Southeast by increasing their own orchards and supporting farmers and investors who have the same vision. From left: Kevin, Jason, & Sam Shaw. Sunset over the orchard. Georgia Olive Farms oil is a true Extra Virgin Olive Oil. From field to our own mill in less than 24 hours, our oil is collected from only the first pressing of our fruit. And, as reported by Richard Villadoniga of eat-american.com, many celebrated Southern chefs are snapping up bottles of Georgia Olive Farms’ oil, including James Beard Award-winners Sean Brock of Husk in Charleston, S.C., and Linton Hopkins of Restaurant Eugene in Atlanta. Gayla’s Grits began in 1997, when Kevin Shaw (of Georgia Olive Farms) and his wife, Gayla, began grinding naturally grown white corn into grits for their personal consumption. They began bagging and giving their grits as Christmas gifts after family and friends raved over the unique creamy flavor. Due to the overwhelming amount of positive feedback, Kevin and Gayla decided to market their 100 percent all natural grits.